, an English dissenting minister, was born at Exeter, Sept. 16, 1697. His grandfather was 9, clergyman at Kettering in Northamptonshire; but his father, being educated by an uncle who was a dissenter, imbibed the same principles, and was afterwards by trade a tucker, or fuller, in Exeter. He was sent early to the | free school in that town, where the foundation of a friendship between him and Dr. Conybeare, afterwards bishop of Bristol, is said to have been laid; and thence was removed to an academy in the same city, where he finished his studies. He there displayed pre-eminent natural abilities, a quick apprehension, a solid judgment, a happy memory, and a free commanding elocution. He began to preach in 1718; soon after which a strong debate arose among the dissenters, upon the doctrine of the Trinity, and subscription to tests. The dispute was fiercely carried on among them in the West of England, and particularly at Exeter, where he then resided. As he embraced the obnoxious opinions, he found it necessary to quit the county of Devon, and to accept of an ijivitation to Melborne in Somersetshire. Here he continued till some of his hearers took offence at the freedom of his opinions, and made that place uneasy to him. Then he removed to Ashwitk, an obscure retreat under the hills of Mendip in the same county, where he preached to two poor congregations, one at Colesford, the other at Wokey near Wells, both of which together did not produce more than 15l. per annum. It seems to have been here that he wrote his celebrated “Essay on Fundamentals,” and likewise his sermon “On the Resurrection of Christ;” for they were both printed in 1720. From this place he removed to Trowbridge in Wiltshire, where he boarded with Mr. Norman, a reputable glover. 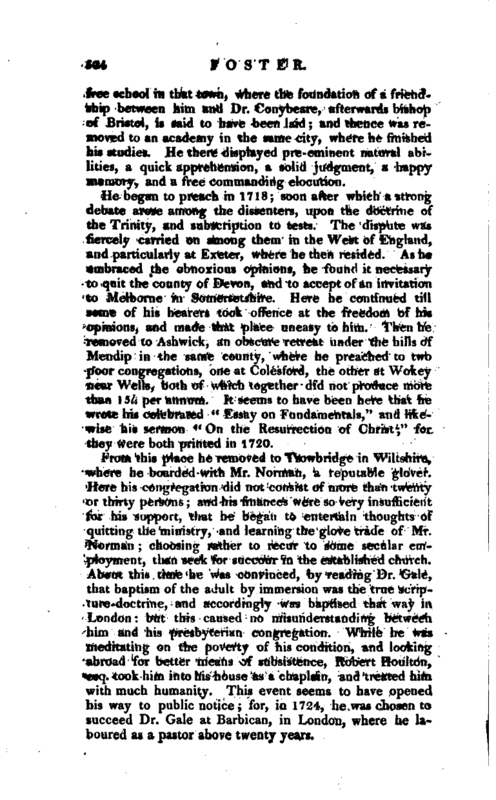 Here his congregation did not consist of more than twenty or thirty persons; and his finances were so very insufficient for his support, that he began to entertain thoughts of quitting the ministry, and learning the glove trade of Mr. Norman; choosing-rather to recur to some secular employment, than seek for succour in the established church. About this time he was convinced, by reading Dr. Gale, that baptism of the adult by immersion was the true scripture-doctrine, and accordingly was baptised that way in Lpndon: but this caused no misunderstanding between him and his presbvterian congregation. While he was meditating on the poverty of his condition, and looking abroad for better means of subsistence, Robert Houlton, esTj. took him into his house as a chaplain, and treated him with much huiiiniiity. Tins event seems to have opened his way to public notice; for, in 1724, he was chosen to succeed Dr. Gale at Barbican, in London, where he laboured as a pastor above twenty years. | In 1731 he published a “Defence of the usefulness truth, and excellency of the Christian Revelation,” against Tindal’s “Christianity as old as the Creation.” This Defence is written with great force of argument, and great moderation has been well accepted, and much esteemed by the candid and judicious of all parties and, as is said, was spoken of with great regard by Tindal himself. In 1744 he was chosen pastor of the independent church of Pinners-hall. In 1748 the university of Aberdeen conferred on him the degree of D. D. by diploma: for at this time the Scottish divines had the highest opinion of his merit. In August 1746 he attended lord Kilmarnock, who was concerned in the rebellion the year before; and they who lived with him imagined that this attendance made too deep an impression on his tender, sympathizing spirit. 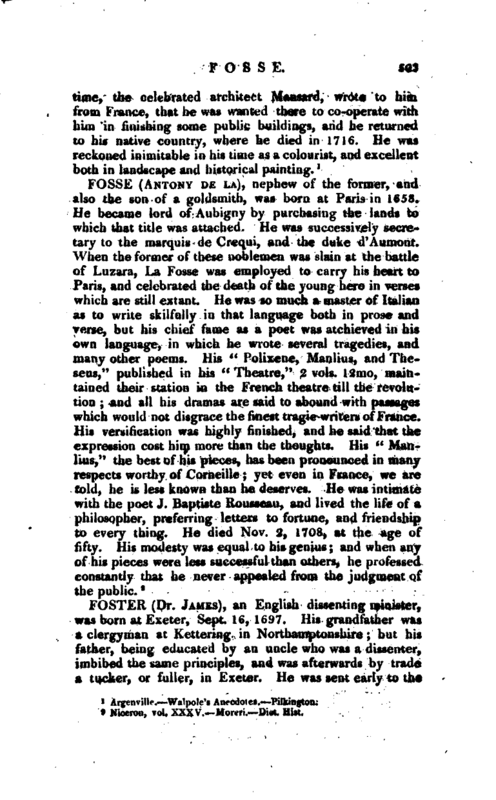 His vivacity at least was thenceforward observed to abate; and, in April 1750, he was visited with a violent disorder, of which he never thoroughly recovered, though he continued to preach more or less till January 1752. Three days after, he h’nd another shock of the paralytic kind, which so impaired his understanding that he never possessed it rightly afterwards. About ten days before his death he was paralytic, but did not entirely lose his senses till the last, Nov. 5, 1753. 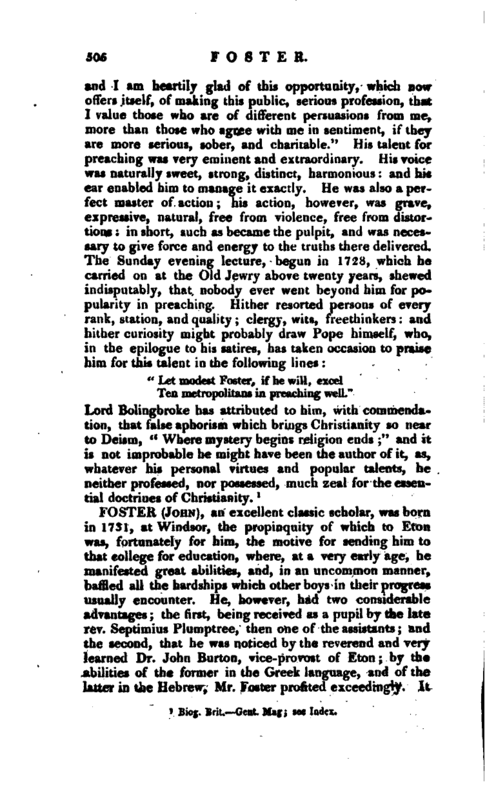 Besides the pieces already mentioned, he published “Tracts on Heresy,” on which subject he had a controversy with Dr. Stebbing; several “Funeral Sermons,” one among the rest for the rev. 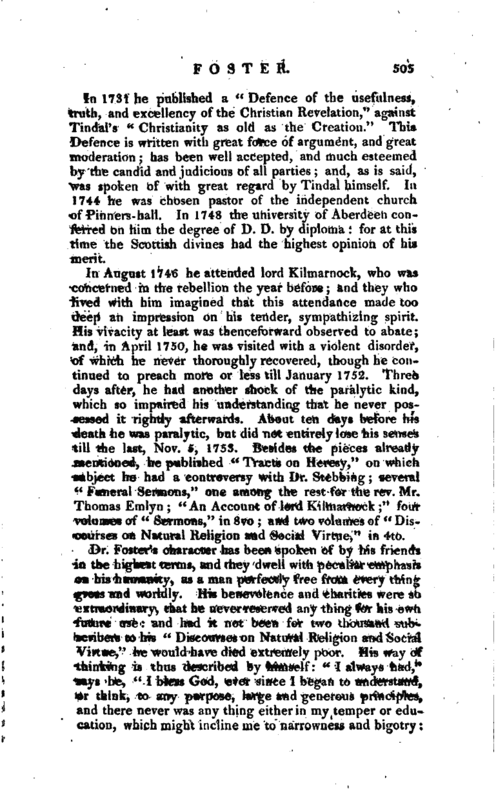 Mr. Thomas Emlyn “An Account of lord Kilmarnock” four volumes of “Sermons,” in 8vo and two volumes of “Discourses on Natural Religion and Social Virtue,” in 4to. Ten metropolitans in preaching well." Biog. Brit. Gent. Mag: see Index.